Use Spotlight API Stored Procedures to browse dimension tables in the repository. Then use additional stored procedures or custom T-SQL to retrieve data. We want to know the names of the available data sources and the names and domains of the monitored objects. In SQL Server Management Studio, create a new query against the Spotlight Statistics Repository. Use the Spotlight API stored procedures to browse the dimension tables. We can see here that we have data from Windows, SQL Server, the Diagnostic Server and alarms (availability). We can see here that there is one Diagnostic Server writing data to this repository. There can be multiple Diagnostic Servers, each one resulting in a row. What statistics are available to us? Now that we have some information about the Diagnostic Server, monitored servers and categories of collections in the Spotlight Statistics Repository, we want to know what statistics are available to us. 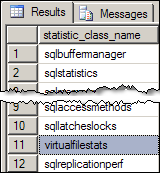 Run this query to find out what columns are available in the virtual file stats table. Specify the datasource and table name. We need to produce the report over a time range, but for curiosity’s sake, we would like to find out the time range of all stored data for a particular domain name, monitored object, and table combination. Run the spotlight_get_table_span stored procedure and specify the domain name, monitored object, and table name. Spotlight_get_table_range returns data for the requested time range for a table, for a particular monitored object and domain. The query returns all columns for the table virtualfilestats. Although there is a lot of useful data in this query result, it is not ideal. SQL Server custom counters are stored in the statistic class sqlcustomcounters and Windows custom counters are stored in the class windowscustomcounters. Use Spotlight API Stored Procedures to retrieve date ranges and column names with these like any other data collection. Note: Pre-requisite: You have created a custom counter in Spotlight and now want to create a report that contains data from that counter. This is a sample T-SQL statement that retrieves SQL Server custom counter values. These are the results returned for the custom counter Pages Allocated. Querying alarm data is the same as querying other data stored in the repository. Alarm data is stored in a statistic class called ‘alarms’. This is a sample T-SQL statement that can be used to retrieve alarm data. Required parameters: monitored object name, start and end times. These are the resuts of the sample T-SQL query.